Can Night Shades Be Motorized? FAQ: Night shades: can they be motorized? Night shades can be motorized and retrofitted by sliding our tubular motors into the existing tubing. Our 'mini' motor fits tubes with an inside diameter as small as 3/4" (18mm), and you can also replace the tube with a bigger size that can use heavy duty 12v motors. Our 12v motors are safe for children, and an electrician is not required for installation, making it a perfect DIY project. Our radio motors use RF (Radio Frequency) signals from our multi-channel remotes; a small antenna in the motor receives the control signal and activates the motor. You can have multiple night shades in a room and control them individually, or simultaneously. 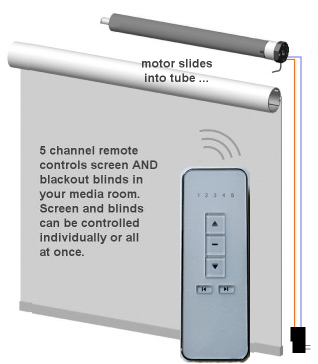 Our multi-channel remotes can be programmed to control night shade motors in various different rooms and hallways throughout the house. The radio signal is not directional and the remote does not have to be pointed at the night shade, and the radio commands can reach almost anywhere inside your home. Night shades can be installed with dual rollers for selecting different shade fabric for day and night - you could use blackout shades at night and translucent shades during the day. With our ZWAVE interface system and Vera, or other home automation systems like Raspberry Pi, HomeSeer, or Event Ghost, you can control your Rollertrol™ motors and other devices with your phone, tablet or PC, while at home or away!